Players will be able to build their own missions in Metal Gear Solid 5 on their smartphones and tablets. 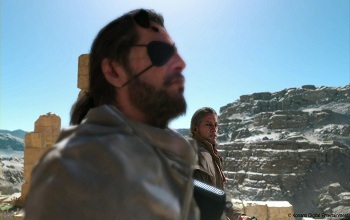 Metal Gear Solid 5: The Phantom Pain looks poised to make some big changes to the way the long running franchise plays. While it should maintain the franchise's trademark tone of super-serious wackiness, it will be the first game in the series to implement open world mechanics that, in turn, could revolutionize the way the game is played. Speaking about the title recently, series creator Hideo Kojima revealed some of the surprising reasons that his team opted to go the open world route. "You can use smartphones and tablets to interact with the world," stated Kojima. "That's why we did an open world, because we thought about all these interactions on multiple devices." While we're sure there are probably some other reasons as well, his discussion of second screen functionality revealed a new, potentially exciting addition to the game: user-generated content. "Using tablets and smartphones you can also enjoy MGS V and create user-generated missions within the world." A lot of gamers sometimes scoff when developers bring up things like second screen integration, but this actually sounds like a really useful and practical way to bring tablets and smartphones into the game. Coupled with the title's new open world structure, user-generated content could vastly expand on The Phantom Pain's replayability. Likewise, the idea that we could be sitting on the bus crafting an MGS5 mission on our iPhone is genuinely exciting. In the least, it could represent a big step forward for a series that has arguably struggled at times with giving gamers enough content.